‘Nduja is a Italian spicy pork salami that is soft and ‘spreadable.’ It’s traditionally made using meat from the head (minus the jowls, which are used for guanciale), trimmings from various meat cuts, some clean skin, fatback pork shoulder, belly, tripe, roasted hot peppers and spices. It is the roasted red hot peppers that give ‘nduja its signature flavor that represents its origins in Calabria, Italy. ’Nduja is usually served with bread or cheese but also can used in as an ingredient. In this recipe we take oven roasted potatoes and add an extra spicy dimension with the ‘nduja. 1. While preheating the oven to 400F, warm the chicken stock, olive oil and butter in a small pot until the butter is melted (we prefer stove top but you can use your microwave). 3. In a large bowl, combine the ‘nduja, garlic, lemon juice and flour with the heated stock mixture (except potatoes). 4. 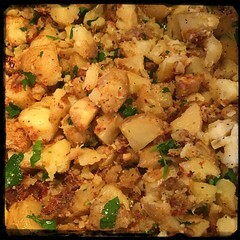 Toss the potatoes with mixture and place in roasting pan, let cook for about 60-90 minutes (mixing every 10-15 minutes). 5. Place in the oven and let bake for about an hour adding salt and pepper (to taste) near the end, let cook until golden brown. Mix ever 15-20 minutes. 6. Finally, toss in chopped fresh flat-leaf parsley and mix well.